Tecumseh-based web design firm, Artonic, wins "Best in Category" Horizon Interactive award for their work on Raisin Township's website. Artonic won "Best in Category" for their work on the Raisin Township Website. The Horizon Interactive Awards, a leading international interactive media awards competition, announced the 2013 award winners to highlight this year’s “best of the best” in interactive media production. Artonic, a Tecumseh-based web design firm, was recognized with a Best in Category award (Towns and Municipalities) for their work on Raisin Township’s website, http://www.raisintownship.com. The Best in Category award is the second highest award that can be achieved in the competition. 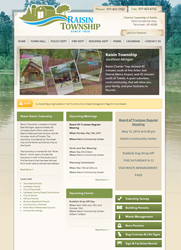 Raisin Township’s website was developed with user-experience and aesthetics in mind. Photos of the local community enhance a straightforward, modern, and simple layout. The navigation, design, and custom features work seamlessly together to offer the user a fast, easy visit. The 12th annual, international competition saw over 1,600 entries from over 24 countries around world and nearly all 50 of the United States of America. An international panel of judges, consisting of industry professionals, as well as an end user panel evaluated categories ranging from online advertising to mobile applications. The 2013 winning entries showcase the industry’s best interactive media solutions including web sites, mobile applications, print media, interactive displays, public exhibits, online advertising, video, email and more. Local entrepreneur Matt Harper founded Artonic in 2005. Since that time, Artonic has grown into a full-service Internet Marketing and Web Design company, specializing in custom website development, design, marketing and maintenance. Artonic is a leading web design and digital marketing agency in Michigan. Learn more at http://www.artonicweb.com.